This cake is simple, sweet and slightly sour from the fresh, ripe plums. It is adapted from Pineapple Upside Down Cake in "Recipes for the Specific Carbohydrate Diet" by Raman Prasad. Mix the eggs, honey, butter (once it has cooled), vanilla and cinnamon. Mix in the blanched almond flour. 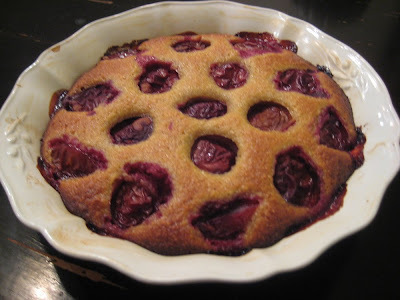 Pour into the baking dish and top with plums skin side up.